I’ve been told by an eventing friend that hunter/jumper shows are a foreign world and leave her feeling very confused. It’s hard for me to see that since I’ve only been to hunter/jumper and open shows, but after reading some blogs lately about people feeling frustrated to some degree after attending a hunter/jumper show I thought I’d give my two cents. It may or may not be helpful, and I’m sure I’ve missed something so if my fellow hunter/jumper enthusiasts remember anything I left out please feel free to comment! This advice is based off of a generic schooling or local show (aka not rated with USHJA/USEF) and from my experience. I’m sure some places run things differently, but my advice is based off of my showing experience in NC and TX and probably similar to what you’ll find in the rest of the US as well. 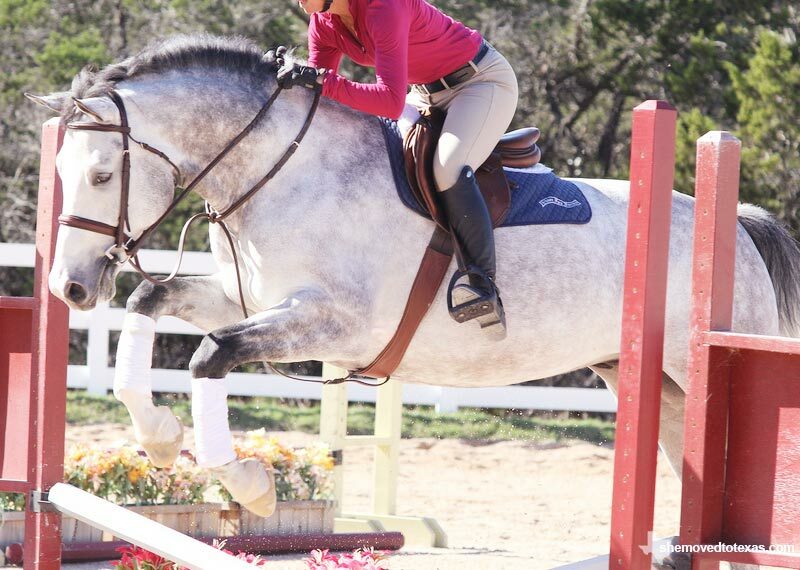 Yes, at hunter shows you can school the jumps before you show. This is a large reason of why I find them awesome. 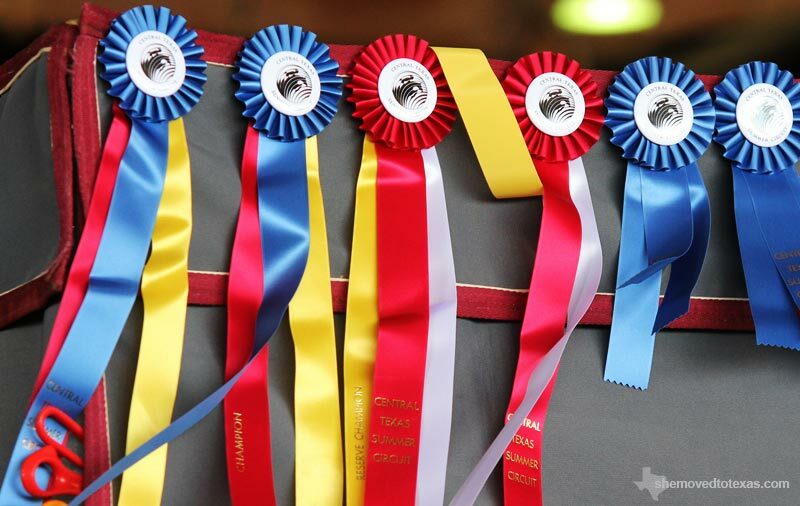 Check your prizelist and schedule for schooling times, but usually the show will start around 8:00 – 9:00am and the ring will be open to schooling before hand. If you’re lucky, they may stop for lunch and have a schooling break as well then… but that’s not usual at the bigger/more popular shows. Official schooling time is your only time to ride the lines and jumps that will be set for the show. It’s really helpful to have a trainer or buddy present, because people will be setting the jumps up and down to different heights. If you’re alone, you’re at the mercy of whatever they are set. The schooling ring will be chaos – sorry. You can’t tell me that the schooling ring is ever chill at any horse show, so just call your lines clearly (if you want to jump the diagonal say “Diagonal!” as you canter up to it) and be mindful of those around you. Outside of schooling times in the ring, you’re most likely going to be limited to a few single pole jumps in the warm up area. Approved helmet – Preferably black “modern” (aka GPA or CO or IRH look-a-like) but black velvet is still A-okay. Leave your bright blue schooling helmet at home though. Hair tucked up into your helmet in a hair net aka Hunter hair. White wrap collar (or traditional rat catcher) long sleeve show shirt. Do not wear a short sleeve show shirt. If it’s really hot out, you can also pass with a white polo shirt. Shirt tucked in with conservative belt. Jackets are optional at local/rated, but if you wear one it should be conservative like navy, black, or a dark charcoal. Black field boots (dress boots okay too) or black leather half chaps and paddock boots if you don’t have field boots. Loud color (aka bright pink) show shirts are going to be frowned upon if you’re older than twelve. What does my horse wear? When in doubt, follow George Morris’ advice – clean and tidy. Your horse needs to be sparkling. Bathe him a few days before and give him a good curry. Oil his hooves before you go into the show ring, and run a comb through his mane and tail. If his mane is pulled short, don’t braid it unless your braids are stellar. A hunter judge prefers no braids to bad braids (ask me how I know). For tack, use a white fitted pad. It doesn’t have to be expensive fleece, just clean and well fitted. 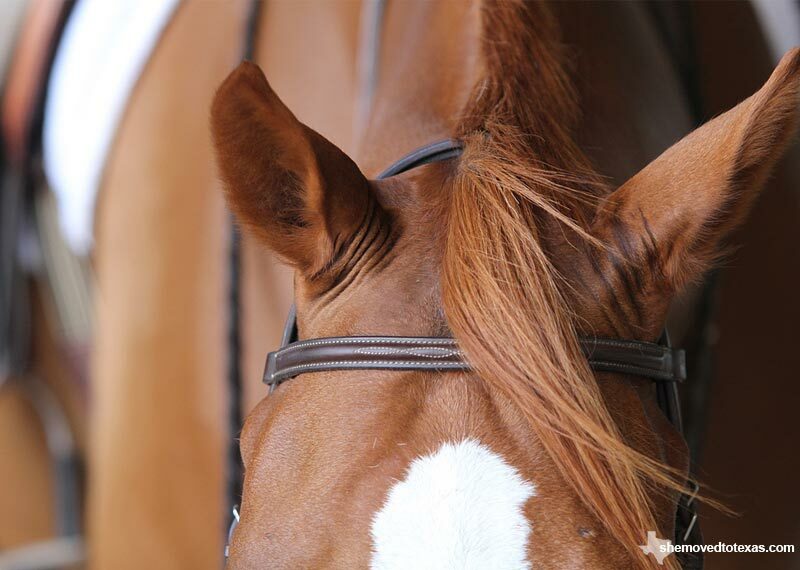 Make sure his bridle is brown and also fitted to frame his face nicely – it doesn’t need to be a fancy stitch, but it needs to be clean. Also double check your bit is legal in the hunter ring, because Gags and ring bits aren’t allowed, etc. Avoid breastplates in the hunter ring, and the only kind of martingale that is allowed is a standing. Don’t feel like you need one to fit in though – if your horse goes best without than leave it off. Where the F@#$! @#$ is my ride time? Yeah, you don’t get one. Fun times for you. Hunter shows last forever, and if you haven’t heard the phrase “hurry up and wait” before you’re about to get really accustomed to it. Class numbers are almost irrelevant. Listen for division names and know the name of the divisions you’re competing in. Find out if you will hack before or after you jump. The ring steward will tell you. At any time, you can ask the ring steward “how many trips out” there are until blah division. Assume one trip is two minutes, so thirty trips out is roughly an hour away. Give 15 minutes for a hack and 15 for a course reset, 30 if they’re dragging the ring as well. Check in with the ring steward at least 30 minutes before your division if not earlier. You will want to get into a rotation – so you can ask to be at the beginning or the end of the division. The steward will put you in a group of 3-4 riders and that will be your rotation. That way you aren’t doing all your courses back to back or an hour apart. If you don’t check in, you’re probably getting screwed and will have no idea when you will go. 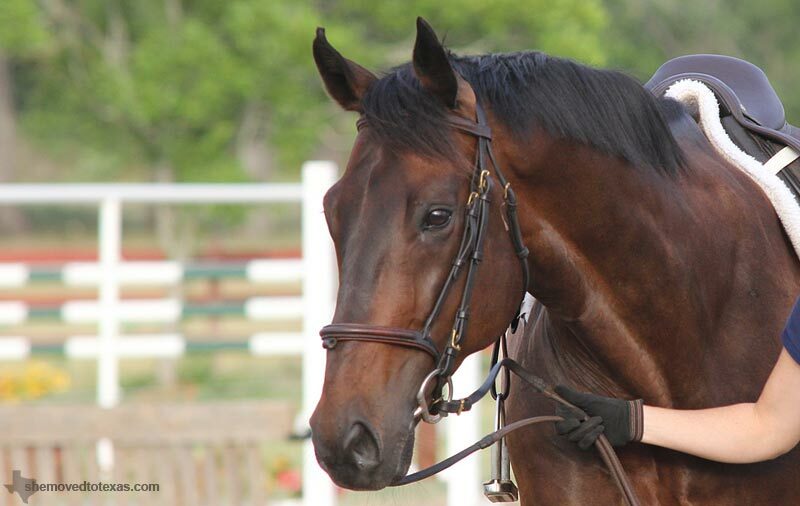 Expect to learn at least three courses (maybe more) whether you are showing hunters or jumpers. Usually the courses are posted at each ring, and often times the ring will use the same three courses all day for each division in that ring. What does this mean? It means you have ample time to learn them and can watch riders go before you and do the exact same course – even if they’re in a different division. Usually your warm up course is the same as one of your hunter courses, so that’s one less to remember! What exactly is this warm-up class? Yes, we get to school the jumps before and do a warm-up round. Another fabulous benefit of being a hunter! The warm-up class sometimes costs a bit more, and you can only enter it once per ring. It technically is judged, although I never worry about the judging in the warm-up. The judge will take all the warm-up courses from all day long and judge them together to pick a winner, who usually gets some cash. I don’t know why it works this way, but that’s how it works. Get the warm-up, you’ll thank me later. Relax. I promise the hunter world is not filled with snobs who are out to get anyone from a different discipline that wants to come play for the day. There are bad apples in every bunch, but it has really been my experience that if you are nice and courteous and ask questions the show officials will do their best to help you. After all, you are supporting their show (aka earning them money) every time you come… and they want you to come back! That being said, if you run around rolling your eyes at the dumb “hunter princesses” and telling everyone how much better things are at shows in your discipline – nobody is going to want a thing to do with you. It’d be the same thing if I went to a dressage show, had no idea what to do, and then blamed all the “dressage queens” for ruining my day. If you have any questions or I forgot something, please leave a comment. There are plenty of people who read this blog who know way more about hunter/jumper showing than I do and can surely help! I think I want to move to Texas :). I’m a long way from being an expert, but here in Maryland, half chaps are not OK, jackets are a must unless specifically excused, and a polo shirt isn’t going to fly unless its the one “dress down” show the local horse show assoc. holds each year. I’ve never seen a warm up class either – that sounds awesome! Around here, it depends with half chaps. At a schooling show, you’re totally fine with half chaps. At the larger shows, it’s technically okay but you won’t see it. As for polo shirts or waived jackets, it gets to 105+ in the summer so polo shirts are pretty much the norm for our legit but not technically rated show series. We have some schooling shows held at local farms that allow half chaps but the local associations all love to say ” proper attire required”. I struggle with finding tall boots to fit, so no shows for me right now. See to me half chaps can totally be proper attire when good quality and fitted properly. I saw someone show at WEF in the Hunter Derby Finals in half chaps. They were nice show ones, shiny as all get out, and properly fitted. You couldn’t tell the difference in the ring. Whisper and I went to our her first H/J schooling show. She hadn’t seen anything beyond poles and standards, so our first round at 2′ was trot to the base of the fence – stop – jump from a standstill. I laughed at her an coached her over all 8 fences, and left the ring wondering what I had gotten us into… Immediately, another rider approached me and patted my leg saying, “That was some nice riding! I’ve ridden that sort of horse before, and you did a great job with her!” At that point, I knew that no one was judging us for being green. By the end of the day, she was doing the 2’6″ jumpers like a BOSS! Everyone had nothing but nice things to say. It was a perfectly positive experience for us. And I **STILL** don’t know what the judges are really looking for! I’ve always wanted to do a cheat sheet for all the different divisions at H-J shows. I’ve been showing since I was 14, so to me the divisions makes sense but I know a lot of people get very confused. Yes, please do! I would love to see it!! Around me, the warm-up is judged “blue/red”, meaning that each rider is judged and if they score above 75 (I think) they get a blue ribbon and if they score 65-75 (I think) they get a red ribbon. Ooo! I want that! Moar ribbons!!! Never had a problem with Breastplates in the Hunters, nor Dark Brown, Light Brown, Hunter Green Jackets. Also stock pins are no problem, just not whats popular right now, but no one is going to frown upon you. Jackets were only optional if its 90+ degrees. I literally NEVER see anyone wearing halfchaps and paddock boots, I think that would get more strange looks then a non navy jacket or a stock pin. At the rated you don’t school jumps in the morning, but you usually have a whole day before the show starts to school all three rings. None of the things you mentioned aren’t forbidden, but they aren’t in style in the ring. Still sticking to my well fitted half chaps are fine though – http://farm9.staticflickr.com/8533/8617364903_0232fdac24_z.jpg, photo from the WEF Hunter Derby Finals. Good info on rated shows! I haven’t shown rated, and stuck to local/schooling for the purposes of this post. Half chaps have come so far from the velcro days that unless you are really looking for them they blend right in half the time. Great list!! At the shows I have been to, they always judge the warm up class like a regular class AND I agree… Absolutely do it!! One thing to add… You do have to memorize several different courses BUT they are simple, there is no “jump off,” and no pre course walk. Another reason my brain can only handle the hunters! Absolutely. The checking in thing is KEY. Good tips, and I agree about the “secret class decoder ring” suggestion from someone else. Whyyyy is the “under saddle” class the flat class? Aren’t all the classes “under saddle” (i.e. I’m riding my horse, as opposed to an in-hand class). So confusing, lol! I also highly recommend taking along an “in the know” hunter friend with you if you’re not showing with a trainer. Someone who knows how to calculate approximate round times, set warmup fences, and talk to show management about class times while you’re wrestling with your greenie. Super awesome helpful (ahem Lauren)! Great tips for some newbs! I have no personal desire to show, but this is still really interesting!! It makes a lot of the blogs I read make more sense lol. Thanks! Great post! So it isn’t a bad thing that I can’t find my stock pin??? Seriously, I had no idea they were out lol. I haven’t shown “real” hunters in many years but it’s where I got my start. Thank you for mentioning long sleeved shirts! My thought process was always to wear one, and definitely wear on one a hot day! Why? If jackets were excused then a long sleeved shirt looks so much classier! They never used to offer schooling rounds when I was a kid. I so wish! My gelding was great if he could have a look at things first but total fail if he couldn’t (he hated flower boxes). Should mention, keep the AQHA style number pads in the AQHA. Funny, the little regional differences like breastplates and such. Ah, all you hunter ladies make me want to teach Dee to jump! Oh good call on the AQHA number style saddle pads. Definitely not good in the hunter ring! These are all great tips but in some ways it sounds even more complicated than I thought! I’ve only ever shown hunters on our local, unrated schooling circuit so it is very relaxed. I think I would like to do a “real” hunter show sometime just for the experience. Maybe once Loki gets a little more settled in jumping. Great post! When my poor former-eventer self first went to a H/J show I was a NERVOUS WRECK about when I rode. I didn’t understand open cards at ALL and was freaking out when I heard someone’s round announced for a class after mine and I hadn’t even tacked up yet! That is truly confusing for those of us who didn’t grow up around it. Pet peeve at Hunters is how often the back gate will sit empty/held for someone warming up. hate that. Go ride. Also, I believe I saw in the rule changes that Running Martingales are now allowed. I doubt they’ll be en vogue for a while, but glad to see they are no long officially forbidden! I’ve been that unfortunate rider that has been stuck holding the ring because of my warm up- not fun! But it’s always been because my trainer is trying to juggle a bunch of schedules and is racing from ring to ring. I try to give those folks the benefit of the doubt! I agree with everything you said, except I agree with Susan — I don’t think half chaps are ever wise to wear at a show. I agree that you can still look classy doing it, but I would just generally advise against it. Doesn’t make as good a ‘picture’ in my opinion. I am from Texas, but still also agree with Susan about the polo shirts/jackets issue. I see jackets (even at schooling shows, and ESP in the hunters) as essential, unless an announcement is made that they are optional due to heat, which does happen a lot down here. If you must take off your jacket, I’d only take it off for hunter classes, and put it back on for equitation classes, stake classes, and/or classics. Polo shirts are never okay in the hunter ring. If its hot its okay to wear a polo in the jumpers, but hunters should always have a long sleeved, classy, tucked in show shirt. Very interesting that in Maryland they have no warm up classes! Had no idea! I wonder how this affects rated shows. For instance, if Maryland doesn’t do warm up classes, then riders from Maryland may legitimately accrue less points than riders from other states because their horse doesn’t have the warm up round (who knows how big an effect this actually has on individual riders, but as a collective it may be true). I wonder if it must be zone wide that they don’t get warm ups. Last but not least – schooling over the fences. One thing I find interesting is that at a lot of shows (always at rated shows, and at a lot of schooling shows too) you are NOT allowed to school over the jumper course, only over the hunter course. This used to baffle me back when I showed jumpers because I never could see why there should be a difference. Check out my blog if you like. I’ve been following/being inspired by you for a while now. I guess it depends, but on our local circuit polo shirts are 100% okay. In the summer (especially during our three show ‘Summer Circuit’ series) 90% of the riders are wearing polo shirts. I once asked a judge friend about half chaps and she said she usually couldn’t tell the difference in the ring, but if it was a rated show and she knew then she’d have to knock off in equitation only. Apparently it’s a USHJA rule that half chaps are not allowed in rated equitation classes! Things are a bit different here in CA 🙂 I def rock the brown (light gray, navy too) coats and pastel shirts and have never had a problem (Eq/Medal class you need white and navy). We always wear coats, tall boots etc and dress to the nine but I have all the stuff so it makes it easy. Yes, no martingales under saddle! Nice job Lauren!! Also if u have kids please note that traditional judges hate that sparkly crap for ponys feet. And if you’re putting big bows in the braids on kids make sure their number isn’t covered! Don’t forget your black gloves everyone! My best advice- as Lauren mentioned- scope out the territory. Know where your ring is, check in with the back gate to get estimates on division times and sign up for your group, learn your courses in advance. Because no matter how prepped you feel- there is going be that inevitable “Hurry Up and Wait” moment where you had to be on your horse like…. 5 minutes ago. But no worries! You’ll be sitting on it for an hour! I like to make sure I have my outfit organized into a single garment bag- socks, hairnet, gloves, number, bobby pins, spurs. All the little stuff that I don’t want to be scrambling to find at the last minute! This is really interesting, thank you! I did IHSA in college but I think that’s far from a typical hunter thing…especially at the levels I was riding. I do like my show bow, though I know it gives many people palpations. What’s the argument for/against stock pins? I know I had to get one for IHSA but that was 10 years ago now. Since then I’ve included it in my showjumping stuff for eventing. Honestly stock pins are technically fine, they’re just out of style right now. For me a big part of hunters is playing the part and I want to look like I “belong” so stick pins and monogrammed collars are out at the moment. I should have been more clear – when referring to a lot of what is in here I was sticking to local/unrated only. Have never been to a local/unrated show that didn’t allow schooling the morning of but I’m sure they exist somewhere! Agree, I’d complain if someone was rude to me at a show. You’re right about it being way too expensive to deal with that. No stock pins? We wore them all the time when I did hunters… everyone had them, over the whatever you call it that you wrap around your neck and button in the back. I do have to say that having a ride time is one of the best things about eventing… you just show up and boom, you ride. But that would never be feasibly in the hunter world because you do multiple classes etc. I absolutely hated waiting though… it always seemed like I’d get ready too early, and be waiting forever, or ready too late, and be rushed. Ah! I’m going to be a All breed show in a couple weeks (possibly two there is one in September as part of the state fair) lol if i can get my entry form in, and will be competing in both hunter pleasure and dressage with my mare. And I’ve already decided to have my mare wear a breastplate in the flat classes (all they do-not dressage). Especially even though my saddle fits quite well it slips back enough at the canter that I need to use one and can most likely find one that blends into my mare’s coat color. I board my mare at the barn where the first show is so she’s use to the arenas that will be used for it. The other is at the State Fair grounds, so the this one is the test if she behaves well i’ll do the one in September as part of the state fair if not then ill wait or still do it but just a few classes to get her use to being away from the barn. There was a show I helped my trainer with a couple horses she rode in it, and for the English classes they were required to wear full show apparel, so jacket, stock tie, etc. it was English Pleasure, and Dressage. So ill probably bring all my show clothes with me just to be safe.